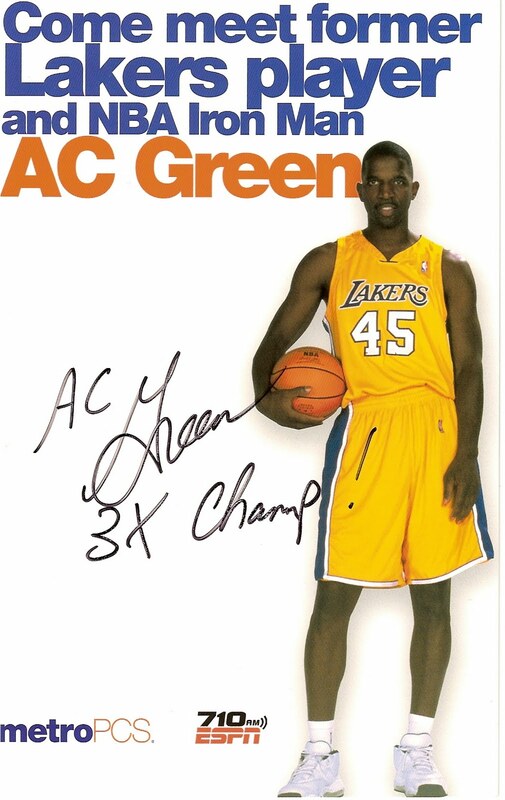 NBA Iron Man AC Green made an appearance at Metro PCS in Pomona. Michael Cooper was originally scheduled to make this appearance but cancelled due to his duties with the USC woman's basketball team. 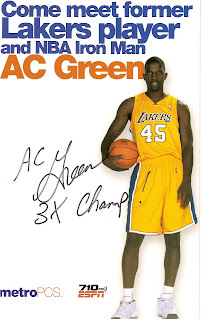 I already had some AC Green signed items from the past so I wasn't planning on going. I was working about 30 miles away from Pomona so I decided to take advantage of the short drive. Compared to most of the signings I go to, 30 miles is a short drive for me. This signing was scheduled from 5:00-7:00 pm. I got off work a little later than expected and arrived at almost 6:45 pm. I barely made it! People in line? When I arrived 10 people were in front of me. Items per person? Multiple items. Did AC personalize? No, only if you wanted him to. Thanks to AC Green, Metro PCS Pomona, and ESPN 710 for this appearance. Most of the time I record video at the signings I attend. Below is a link to my YouTube channel. I have been to signings in the past where only black markers were available for the person signing. So what do you do? Always bring your own markers/paint markers and ball point pens. Unless you want all your items signed with a black marker. Blue Sharpie is good for bats. Black Sharpie is good for light colored items. Silver Sharpie or deco works well on black bats. Use a broad tip silver Deco paint marker on basketballs & footballs. 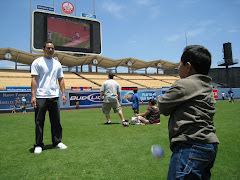 Use black or blue ball point pens for baseballs. I prefer blue. Use what you want. It's just advice for the person who may have just started the hobby.